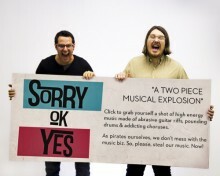 SORRY OK YES is an Italian alternative-rock band from Milan, Italy based in Toronto. The band currently consists of Davide Materazzi (vocals, guitar) and Simone Ferrari (drums). 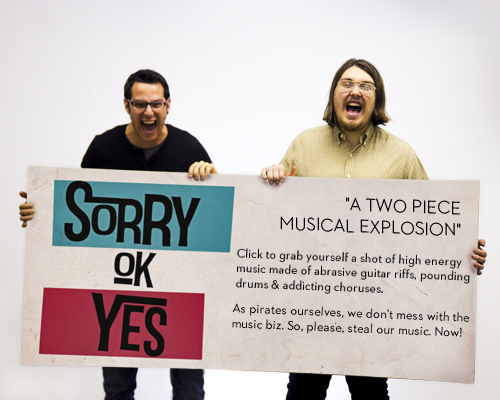 Formed in 2008, Sorry Ok Yes writes, play and produce all their music. They are known for their heavy, bass-sounding guitar sounds and pounding drum rhythms music combined with layered arrangements. Sorry Ok Yes first gained publicity when they opened for New York Dolls at SXSW 2009 in Austin, Texas. In March 2009, music critic Dany Sloan listed them as one of the bands to see at SXSW 2009 on his blog. After playing more than 150 shows around Italy and UK, Sorry Ok Yes recorded their first album “Rubberized” in a 10-days studio session in February 2010. In March 2010 it was announced that Sorry Ok Yes had signed to Halidon Srl, and “Rubberized” was released in April 2010 both in digital and physical music stores. After a one-year hiatus, in 2011 Sorry Ok Yes released their comeback single “Facedown” which distringuished itself from previous releases for the heavier and more layered sound. “Facedown” was the first step of the new course, being the first song fully produced by Sorry Ok Yes and distributed as a free mp3 on their Bandcamp website. Refusing to appear in their videos, Sorry Ok Yes started to rework innovative and obscure videos found on the web to fit their music. Two singles, “SO!” (February 2012) and “Bipolar Girl” (March 2012) followed the release of “Facedown”. In May 2012 it was announced on their Facebook page that the band is going to move to Toronto in September 2012.